Originally published in Raleigh Magazine. Italics are my asides to you, the T&S reader. It’s a coolish morning, and rain beats a gentle pattern on the craftsman’s tin roof. In the front of the shop, finished products are on display, and the trim is lined with bright award ribbons. In the back room, detailed work is in process. All of the tools at the workbench - wire brushes, vices, scalpels, even the stool he uses - are worn from years of use. Jake Rouse swings his next project up into the vice, tightens it into place. He looks it over, then begins. Getting a deer ready to hang on someone’s wall takes time and precision. Rouse shuffles around the shop, unhurried but efficient. He has the round, eastern Carolina accent of his native Kinston, where he first learned to hunt. Inspired by an unpleasant taxidermy experience about ten years ago, he took a basic course through Johnston Community College, which catapulted him into the broader world of taxidermy. He took on work from friends and family, entered competitions, and received one-on-one training from a world champion. As his craft improved and word spread, his business developed roots. 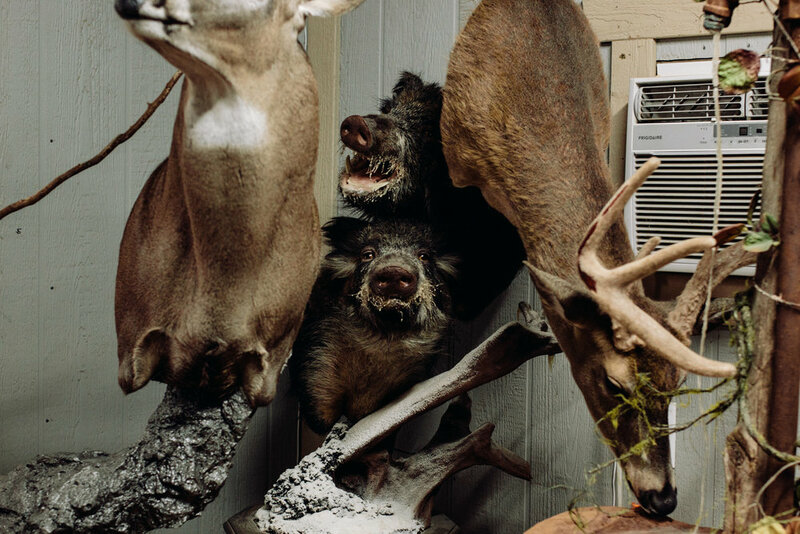 These days, the shop off Ten Ten Road seems to be constantly refilling with fresh assignments, from white-tailed deer (NC’s most taxidermied animal) to ducks, bears (roughly 20 a year), fish, and an occasional piece of African wildlife. Looking around the workroom, there is little in the way of the blood and gore one might expect - this is a place of construction. The Mountain Dew bottle served as a makeshift spittoon - I’ve got an uncle who has always chewed tobacco, so the discreet disposal of old chew felt normal. On Mondays, Rouse prepares foam mannequins for the rest of the week. There is a waxy surface that has to be sanded off, and he must create space between the lips and in the nostrils before skin can be placed over the models. 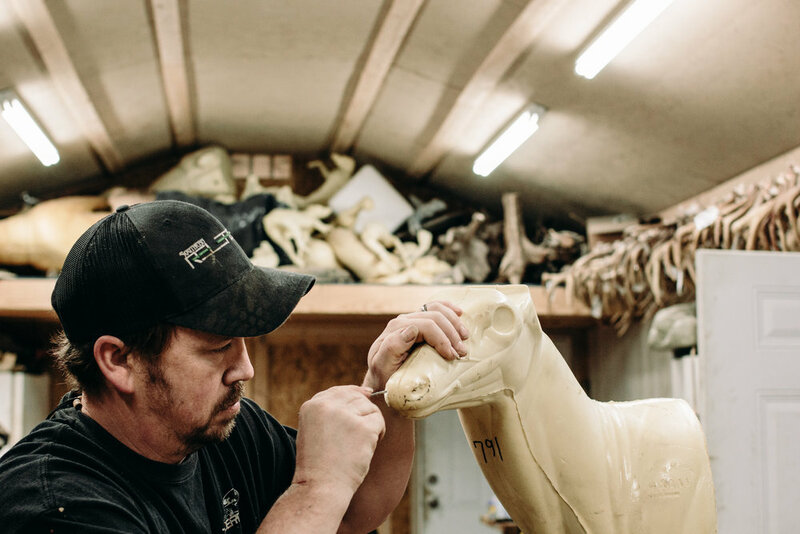 He decisively carves out an anatomically-correct nostril (something one prioritizes after competing in the big leagues) with a drill, guided by muscle memory. Placing antlers atop the mannequin, he scrutinizes their position until he is satisfied, and can drill them into place. With each project, Rouse is keenly aware of “the story of the hunt”, and telling the truth of the animal in its natural habitat. For instance, he points to a mount over his shoulder. It’s a buck, with scars across his nose from a bullet graze that had healed. Every now and again, I take a photo and the second the shutter releases I know I like what I got. This was one of those rare lightning-strike moments. “That’s part of that deer, and part of what gives him his character: that’s his scars.” For each deer, there is a difference in build, in coloring (from grey to reddish), in the length of the white patches on the chest. “Kinda like people, they’re all different,” April Rouse, leaned comfortably over the workbench, adds. She is Jake’s wife and the shop’s capable manager - she’s frequently in and out as she wrangles the logistics of a small business. To the Rouses, the job seems to be as much storytelling as it is an exact science - and there is exact science. A good taxidermist must have a solid grasp of anatomy, measure the hides with exactness, pick a proper mannequin, track hair patterns, and understand the animal’s natural movements. On the other hand, one needs a creative eye to pose the animal, to paint details like eyes (he says they are “the soul of the mount”), to find the beauty in it. The adhesive Jake uses to bind everything together has a sharp, but not unpleasant smell. If you had sinus problems, it would help them clear out. I expected there to be more chemicals (and animal smells) in the air, but after the hides are removed from the bodies they are sent to a local tanner. That means the office really is reserved for taxidermy, or the “moving of skin”. “That’s part of the art - making it back to what it’s supposed to be. You’re not gonna reproduce God, we’re just trying to get as close as we can,” Jake says. For fine-tuning, he checks reference images and anatomical molds - for inspiration, he goes hunting. Rouse is out in the shop seven days a week, doing work that is routine to the family. Hunting season (September through early January) is referred to simply as “The Season”, and has as natural a place on their calendar as the holidays may have on yours. 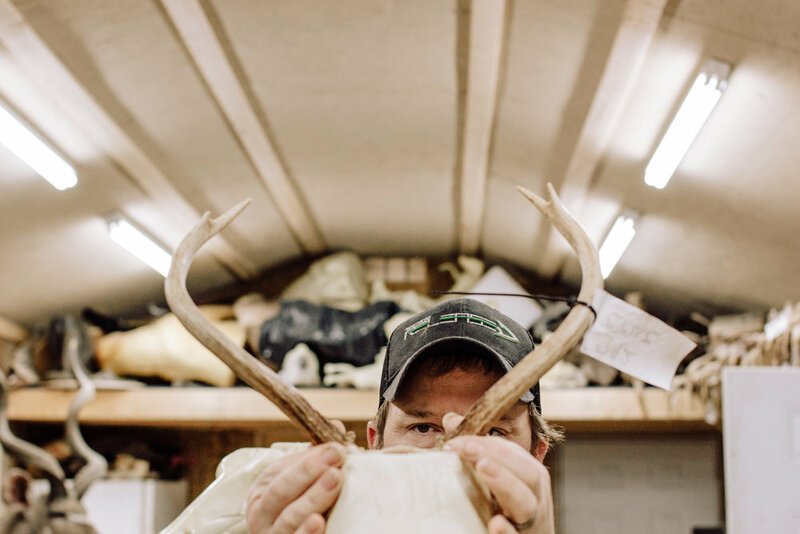 The Season means long hours, organized chaos, and hunters tromping in and out of the shop, delivering their trophies - and the stories that go with them. The hunters vary by position and location - some are 15-year-olds, some CEOs, some from out of state, some from just down the road. The common thread is that they all have a story to tell. When they leave the shop months later, finished mount in hand, Jake Rouse has helped them tell it, with all the truth and beauty he can muster.